No this time it won't be Jim entertaining you but Pierre. 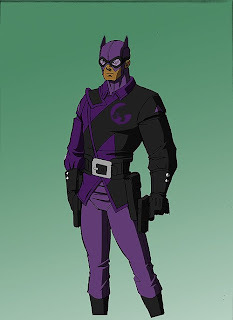 As the official Flashback Universe Art Guru, once in a while, I will add my 2 cents to the Flashback Universe blog to either discuss past, present or upcoming Flashback Universe projects, share my experience as an artist, talk about comics, movies, or a thousand other subjects that just don't come to mind right now. But for this first blog, let me introduce myself and tell you a little bit about me. As far as I can remember, I have always wanted to be a comic book artist. As early as 4 or 5 years old, I would fold in two whatever pieces of paper that I could find and would draw tiny 4 pages comic books. My inspiration at the time was some collectable cards featuring Batman. I would take a card, and make a 4 pages comic based on that card. Sadly growing up.... no one I knew even had a single clue as to how someone could become a comic book artist (or even just an artist). So I had to find out the hard way... and it was a bumpy ride. Like many other artists, I learned by copying other artists whose work I admired. First copying poses I liked, then panels, then entire pages. Then I got my first published drawing. A pin-up of Nova. 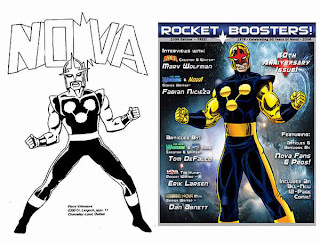 You can compare it to a more recent drawing of Nova that I did for the "30th anniversary of Nova magazine". After high school, I still had no idea on what to do to become a comic book artist. All I could think of was to mail some samples to various comic companies, which got me my first rejection letters. So I went to college in Arts, then Graphic Arts, and finally Illustration and Design. After doing various crappy gigs (posters and business cards), I got my foot in 2D animation. I worked on many TV series (Arthur, Marsupilami, Bob Morane to name just a few) for various animation studios and even a feature film (Heavy Metal 2000, AKA Heavy Metal FAKK 2). Although not being comic book work, working in animation is still for the most part fun. And I learned a lot in animation that can be applied to doing comics. The coloring style used for Flashback Universe for example pretty much comes from my experience in animation. Then between some animation gigs, I started dawing comic book pages for various independent publishers. Sadly I quickly discovered that it does not take much for a project (or an independent publisher) to go down the drain. So not much of what I did actually saw print. So how does one become a comic book artist?? Did I finally solve the riddle that has been plaguing me since I was a kid? I will share with you the secret that has eluded me for so long. Bad News first - I'm only going to have one free comic today, as this is a 50 meg file, so it took forever to load onto the server. Good News - It's got a story where a Robot fights a Gorilla. I would also like to credit Sean Kleefeld with the PCDW graphic I used is yesterday's column. Sorry for the oversight. "I like your Flashback comic, but why do you say to hate paper comics? Paper comics will be here forever being that people all love them. I wish to kick you in the head." 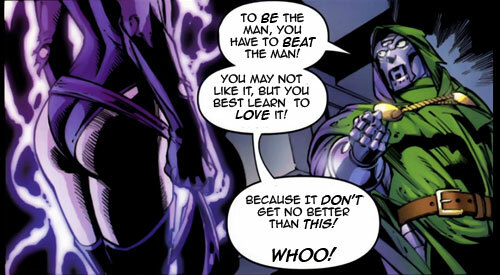 Look, just to set the record straight - I don't hate paper comics. I used to love them in fact. However, given the historical record of comic sales since the 40's, I don't see much of a future for them. EVEN if you were to exclude the effect of rising Manga sales (as Paul Levitz seems wont to do.) AND the rise of trade paperback sales, you'd still be left with the onslaught of digital threats to the industry that seem ready to bust out of the gate any day now. Why I think this is yet another sign of the oncoming paper comic apocalypse is because, well, once you've got a TeraByte capable iPods floating around, people are gonna want to put stuff on them. That's the whole Download/Own It mentality that so many online vendors don't seem to get. Having more room to download and own stuff is just going to enhance this mentality. 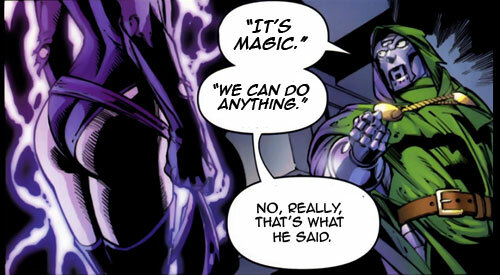 ...unless some joker doesn't find a way to force their hand. See our next item for details. Item Two: Marvel’s Digital Comics Unlimited - Now Downloadable? If you're a subscriber to Marvel Digital Comics Unlimited, you know how awful the official web viewer is. It displays pages, sure, but it is basically useless for reading. Digital Comic Downloader brings the selected comic down to your hard drive, allowing you to choose which viewing software to use. This makes reading issues a pleasant experience, letting you make the most of your subscription. It can even combine the separate text and art layers of newer comics into flat files! Digital Comic Downloader is not meant for piracy. The issues that you download should be the ones that you're actually about to read (and later delete). Marvel has been very kind in not using encryption or DRM and that needs to be respected. Further, the downloads produced are not perfect copies, so even if you had a mind to infringe copyright, what you've got is useless for archiving... But great for reading. Marvel Entertainment, Inc. (NYSE: MVL) has appointed Ira Rubenstein to the position of Executive Vice President of Marvel’s newly launched Global Digital Media Group. In this newly created position, Mr. Rubenstein will oversee Marvel’s digital distribution strategy across all media and platforms. Also on the Beat...Comic sales slip in 1st quarter of 08. Paul O'Brien tells us it's nothing to worry about due to the fact that last year was a big upturn because of Civil War. And while, that's probably true, there are quite a few respondents to the post who suggest that it might be a more permanent downturn. Is it possible that readers are starting to walk away from the big Company Wide Events? Hasn't everyone been saying this day was coming, and that going down the Event comics road was just a bandaid for a bigger problem? DC on the other hand. Item 4: Why is Apple buying PA Semi for $278 million? Some people are speculating that Apple may come out with a bigger PSP type of gaming device. I think the latter is the better bet. The gaming market is extremely tough, and currently, even if Apple did come out with an awesome portable gaming device, there are absolutely no games with any hype around them for people to purchase. Apple would almost have to build the first wave of games themselves (A VERY risky proposition) before other game companies would jump on board. No, I think that you don't have to look any further than Amazon's Kindle to see where Apple is headed with this one. Even though it is heartstoppingly ugly, the Kindle sold out initially. At $400 a pop, that's pretty good. Remember, the iPod wasn't the first MP3 player - it was simply better than anything out at the time. Improving other people's devices is sort of Apple's forte, isn't it? "But is anyone actually reading/buying books for the Kindle?" Yes, people are apparently buying quite a lot of eBooks it seems. Flashback artist Jerry Hinds asked me the other day how do I manage to have the time to work on Flashback while working on other projects AND spending time with my family. You know, I had this big post typed out discussing a trend I saw on this weekend's Headbangers Ball, then I realized that most of you coming to this blog probably don't care about metal, and to just ramble on about bands you've never heard of, nor care to listen to would make this blog like, uh...the Bad Signal, so I just deleted it. Today I present 2 more Black Terror comics from Nedor Publishing in the 1940's. - but let me say this - the idea contained one of those *concepts* I just can't stand - like for instance, Cheerleaders who fight Werewolves! (but that wasn't it) so when Pierre told me his idea I was like, "huh...let me think about it." Pierre also showed me the pictures he drew for the concept - the first two to the left were among those pictures. While I didn't like the overall concept so much, I was fascinated with the pictures. I kept asking myself - "Who is this character?" So with the pictures in hand, I told Pierre I'd find a way to work with his ideas. So I went home and promptly began to figure out how to take Pierre's story (the good parts) and replace the part I didn't like with something I might have an easier time working with. Cheerleaders who fight Werewolves is played. But together, they are played. When I saw this picture - everything started clicking. I new exactly who this guy was and where he had come from. He was undoubtedly some badass barbarian king who had fought his way to the top of some long forgotten mystical country. That guy sounded interesting to me. But it also sounded like we had come in late in the story. I started thinking it might be more interesting to see just how such a guy takes control of his country. So, I had Pierre whip up another design for me, this time with a younger version. That's the fourth picture on the right. This one looked great - I've never been 100% sure what Imperious meant, but I *think* this guy's look is about as good a definition as your gonna get. 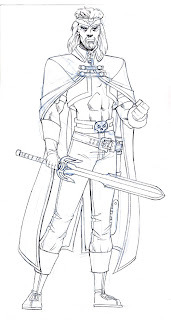 You'll notice that in this version Pierre ditched the the cape and added this interesting sort of Bone Shoulder pads. Initially, I wasn't sure of the shoulder pads - they were a little to Football looking. Still, I sort of liked them. 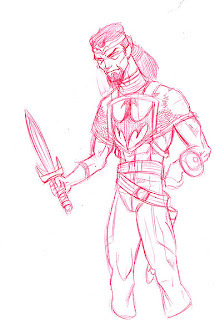 I also wasn't sure about the chainmail hanging over the arm. 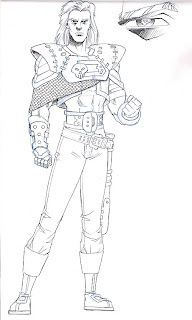 But I did like the idea of a chainmail half shirt - it just makes for a neat visual. 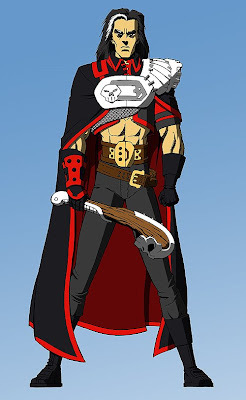 So I suggested a few more tweaks to the character. Then we went through color tests. Always a torturous part of the process, but it can be a lot of fun too. 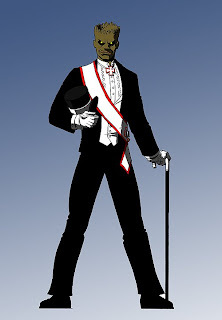 Pierre also added a neat looking club for the character to use as a weapon. 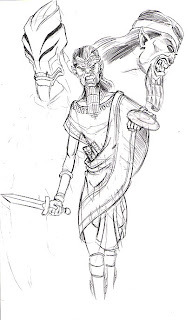 Eventually, we settled on this final version - a character who has evolved past the barbarian king idea I initially came up with into something quite a bit different. Before I launch into this weeks Paper Comic DeathWatch, I gotta couple of items of business to attend to. Item 1: You can get PCDW mugs now! You can now buy Flashback Universe Shirts and Mugs at CafePress. Yes, I know. I am now officially one of *those* guys. Look. Here's how we got to this point - I made some of these shirts for HeroesCon last year, and while making the PCDW shirts for me and Sean Kleefeld, I thought, "Why not let other people buy them if they are so inclined?" Not a bad idea on paper, right? The only problem is that meant I had to tell you guys about them. Ugh. Pimping my own band merch. Next I'll be mashing up Evanescence songs with Anime pictures on YouTube. On the flipside - The Trex vs Prometheus T-shirt is pretty cool. Anyway. Let's just move on. For those of you who've been following Flashback since the get go, some of this interview will be familiar, but there a few things in there you may not have heard me say before, so check it out. Okay, so on with our regularly scheduled Paper Comic DeathWatch. Today I'm going to talk about a new internet technology, that while it's over a year old, I'm betting most of you have never heard of. Microsoft SilverLight. SilverLight has been called Microsoft's answer to Adobe Flash. Like Flash, SilverLight is partly a plugin for web browsers that will allow users to view graphics (both raster and vector formats), animation and audio/video content. There are many, many reasons why SilverLight is superior to Flash on the development side, but I'll spare you the gory details and web developer jargon. 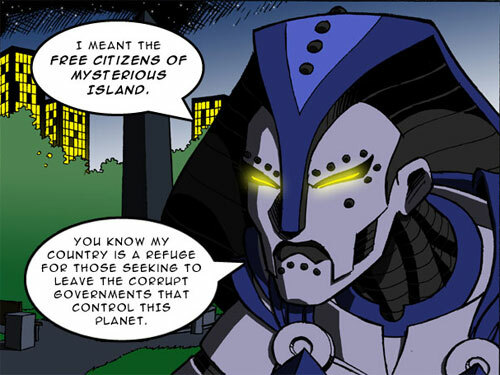 What SilverLight can do, that Flash can't that's pertinent to us lovers of Digital Comics is a feature called Deep Zoom! What Deep Zoom allows you to do is take, well GIGS of images, and stream them over the internet in a way that is just absolutely amazing. The idea is that say you have an image that is 8 megapixels in size (a fairly large image, with lots of detail), well with Deep Zoom, you can zoom in and out of the picture examining the details as you wish and only the parts of the picture you are looking at travel across the internet into your browser. Check out this awesome example of Deep Zoom used live at the Hard Rock Memorabilia site. Note: this site is going to ask you to install the SilverLight plugin to view the content. After you install the plugin, you will be able to use your mouses scroll wheel to Zoom in and Zoom out of the images on the page (see the colored blocks in the picture below? Each one is a separate high rez image.) Notice how fast this process is. Where this all comes into play for Comic Books, is that developers are already starting to see the potential for SilverLight as a method for reading Digital Comics. And here is a talented developer by the name of Jeff Prosise who has built a very nice SilverLight web site called http://mycomix.wintellect.com/ devoted to his collection of Silver Age DC Comic. The neat thing about this site is you can click on a picture, and when the cover comes up, you can Zoom In and Zoom out with your mouse scroll wheel OR turn the cover around to see the back by clicking and dragging the mouse. Where I think this all comes together is with DC Comics. 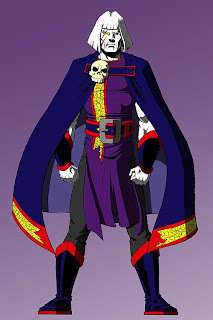 I keep thinking that Time Warner is going to put some major pressure on DC to get busy with an internet project soon - and I don't really count Zuda, because, as far as I know, there is like Zero DC branding on Zuda. Mom and Pop America would never guess that site is related to the company that publishes Batman or Superman. Somebody at Time Warner is eventually going to see the Marvel Comics DCU site and wonder why DC isn't doing the same thing. Now if DC wanted to beat Marvel at this game, they would partner up with Microsoft and use SilverLight to build their Digital Comics library. It would be a great way for Microsoft to spread the SilverLight plugin and a good way for DC to take advantage of all of Microsoft's PR muscle. This idea has already been run by some people at the Microsoft Silverlight team, and they like it. Now, whether DC is ready to start such a project is the question. Today I present 2 more comics from Fiction House in the 1950's. But enough of that..check out this awesome cover. 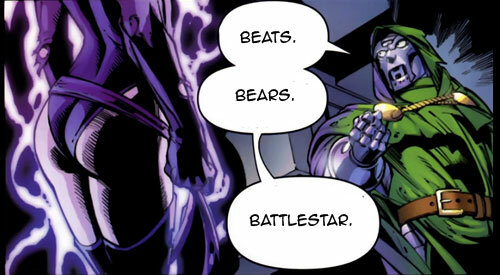 Before I begin this latest installment of PCDW, I'd like to announce that Sean Kleefeld [ http://kleefeldoncomics.blogspot.com ] has won the Paper Comics DeathWatch Logo Contest. Okay, a few weeks ago, I introduced you to the term UMPC or Ultra Mobile PC. And before anyone asks - my subscription to PC Magazine was a gift. Well, this week, I'm gonna introduce you to another term: the MID or Mobile Internet Device. Here are some great videos of a few Mobile Internet Devices in action. Submitted by RAB (the author of the Fantom Force comic) sent in this great link wherein author, pirate DJ, magazine editor and economist Matt Mason giving the keynote speech at the Medici Summit; Matt talks about the theories in his book The Pirate's Dilemma, which discusses the ways that pirates can benefit society, the economy and the businesses they profit upon. Now while this has Zero to do with Paper Comics becoming like B/W Television, his thinking is very similar to mine in that the industry should be learning from the pirate scene instead of trying to close it down. Thank you for the link RAB! Dear Flashback. Do you ever worry that people will think some of your characters, like Lady Nemo, are too similar to some Marvel characters, like Dr. Doom? I think I'm pretty damn safe, wouldn't you say? Today I present 2 issues of Planet Comics, a series from Fiction House in the 1950's. Note from Jim - I will try to find some Mysta issues for another FCM post. For now, check out the awesome covers! ...Sadly, Zuda was not a Digital Comics site. It was a Web Comics site. 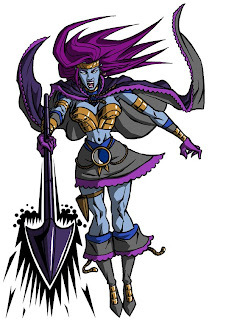 But when High Moon won the first Zuda competition I started to rethink this whole Zuda thing. And comics in general. Because High Moon passed what I call The Father-In-Law Test. See, I on every other Friday night, I watch a movie with my Father-In-Law. These are typically Action movies that I feel my wife wouldn't be interested in. Sometimes they might be Horror or SciFi, but they always have an simple, straightforward plot and good amount of action. These are usually movies that did well in the theater and go on to live forever on Showtime and HBO. (The Rock, Pitch Black, Aliens 2, Con Air, Hellboy) - I sort of feel that's the sort of stories that might bring in a bigger audience to the comics medium. Another term I have for this type of story is 1 Times Larger Than Life with a twist. Fantastic, but not TOO Fantastic. You don't overwhelm your audience with too many new concepts all at once. In Aliens, you've seen one Alien already, but now we're gonna fight a bunch of them. In Terminator, we gonna fight a killer robot. From the future. Con Air is a prison movie. On a plane. The difference between High Moon and Y the Last Man is that High Moon was on the web which makes it infinitely easier for the average joe to stumble across. The difference between Zuda and other Web Comic sites is that it has Time Warner money behind it. I believe that if Time Warner really got behind Zuda, AND Zuda had a lot of content like High Moon, then you might see this sleepy Zombie TV Nation of ours rediscover the joy of reading illustrated fiction again! So, Pierre (who was thinking something along the same lines) and I started working on our own Zuda project. The idea in my mind was to create something that IF it got accepted by Zuda, would pass my Father-In-Law test. I think that's a good place to stop for today. Next time I'll show you some character designs for our project. Attention Artists, Graphic Designers and anybody else who wants to enter: I need a logo for Paper Comic DeathWatch. The winner will receive $50, a T-shirt with their winning Logo and a Flashback Universe T-Shirt. I don't know if I should award this a lot of points. MySpace is such a damn unnavigable mess of 14 year old girls trying to look 18 and 20 something slacker guys hawking their band merch, that I'm not sure this is really worth a single PCDW point. Still, Boom Studios did okay with that issue of NorthWind on MySpace didn't they? Field took on a similar, often-repeated retail myth, that comics sell best during economic downturns, such as the one the country's currently experiencing. The theory generally goes like this: in good times consumers gravitate toward more expensive entertainments, but in bad times "cheap" entertainment (i.e. comics) holds more appeal. By that logic, comics shops are about to enter an unprecedented era of prosperity. Field suggested the assembled retailers not put a lot of stock in the theory, correctly pointing out that in earlier downturns, comics were a cheap entertainment option, but, even when compared to $12 movie tickets, at a starting price of $3 a pop, traditional format comics aren't "cheap" anymore by anyone's definition of the term. but still require a decent capital outlay that could just as easily go for videogames. (Not that the videogame market is having good times right now.) Our buffer of producing product that only costs ten cents in an era where people only have ten cents to spend is long gone.